Let’s start with some mom confessions from the first part of this week. More to come on camping soon. Monday afternoon I dropped off something at my friend's house and ended up chatting. Both kids ended up coming inside to use the bathroom. Yes, I think that was a unified excuse to get around my “Stay in the car, I’ll be right back.” So my friend and I chatted more. We ended up staying an hour and a half. The kids even had a snack. And I left my van running with the windshield wipers on the entire time. Obviously Jenn and I need to get together more often. That evening I was doing more laundry. Honestly, I was hoping when I washed Ben's filthy light-up tennis shoes they wouldn't light up anymore. Apparently those lights are durable; they still light up? At least his shoes are relatively clean again. Surely I’m not the only mom who doesn’t understand the point of light-up shoes? The timing of my remembering is important because Cate had gym class Tuesday morning so we made a quick evening trip to Walmart in the rain just as the kids were getting ready for bed and Greg was at one of his two meetings of the night. Less than five minutes in the store and $12.87 solved the problem. And we were back home at 7:07. And then I was at Walmart again at 7:28 a.m. Tuesday to get a few things to aide in our moving furniture and stuff from our lake house that’s we’re supposed to be selling on Friday, officially. I don't even like Walmart. Twelve hours after I arrived at our lake house we finally finished moving furniture and stuff around. We moved out my girl's too-small bunks and in a full-size bed; traded one recliner for another in our living room; stored a king bed, two sets of extra-long bunks, kitchen utensils and accessories in extra space at my husband's new office; donated stuff to sell in our Guatemalan mission team fundraiser and sheets and blankets to give Guatemala families; donated a few items to the local thrift store. And, yes, we stopped to eat – twice. I am grateful for our real-life friend Daniel who gave up his morning to help Greg take apart and load heavy furniture. He’s worth more than the lunch to which we treated him. All through the moving process I wore the same shirt I had started the day before wearing and then also slept in. Honestly, I had no idea moving and storing and organizing and purging and donating would take all day, literally. I had visions of taking a shower after lunch. But, hey, that's one less shirt to add to the never-ending laundry. Sometimes the car sits running in a friend’s driveway while conversation happens. Sometimes tasks take way longer than anticipated and shirts are well overdue for their turn in the washing machine. But whatever the season, it’s safe to say, it won’t be like this for long. I'm also linking with Anna Rendell's Girl With Blog, where real life is embraced beautifully and mom confessions are encouraged. Kristin, I love that you kept life real for us all. For me, life is real in that I have now had a new vacuum for almost 2 weeks & have yet to run it. I cannot believe I am even admitting this :) but it is true. But it is a beautiful looking vacuum & I look forward to using it soon, lol. Life is real & it truly is safe to say, it won't be like this forever. And I'm even more grateful our God meets us right there, smack in the middle of "real". May you have a great Wednesday! I don't really even like to vacuum. Thankfully, we don't have many carpeted areas, so I can usually get by with sweeping. But, hey, absolutely no judgement here regarding chores of any kind. :) Thanks for your sweet encouragement, today and always. I am so grateful God meets us wherever we are in whatever we're doing. Life is SO real, my friend! I absolutely loathe moving, Walmart, and light up tennis shoes. I found myself nodding through all of your words here. I'm thankful my son finally quit those shoes, but Walmart is still unavoidable at times :). I hope you can get a little time to yourself today and just chill! Yes, small towns mean Walmart sometimes. Praise God for Amazon, seriously. I wouldn't have caved to the light-up shoes, but the selection was so slim. At least I know his foot will grow sooner rather than later. :) I'm enjoying a quiet morning right now. So thankful for it. And you. Seasons seem to be a theme. Life is real. 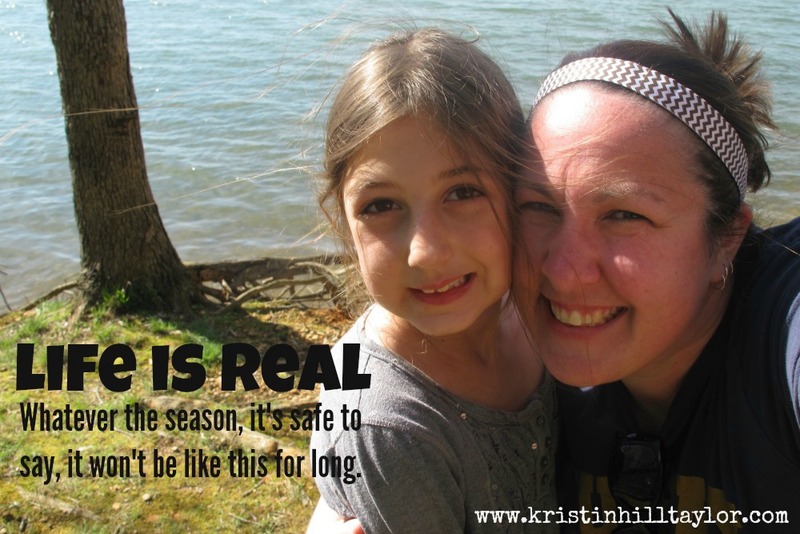 We cannot stop the seasons from turning, but we can change how we respond to them. Great word, this too shall pass! I don't like going in Walmart either! Love Amazon, but we do what we have to, right? I had to backtrack Friday, after leaving for Winsome and go to Walmart for something I forgot! Thanks for being real! Life is real. It's so great that God wove some fun and friendship in to the "realer" moments of life. All I could think was that in CA, if you left your car running in the driveway, it could very well be gone when you got out. Sad, but true. And, I'm no fan of Walmart either. ;) Thanks for sharing your journey and confessions with us! The beauty of a small town is the ability to leave the mini van running! :) Thanks for being here, Tiffany! Seasons are most definitely a theme in my own life right now. And, yes, I need to continue seeking God in responding to the seasons. My first reaction isn't always my finest. :) I hope Winsome was so much fun. I've loved seeing some pictures from the weekend. Glad you're here, Kathleen! I think this is when it's safe to say, "Stuff happens!!!" Oh wow...I've done the CRAZY moving thing before...9 times actually...and each time we swore we would NEVER do it again. Ahem...wait, maybe I should just delete this right now! Ok...you are SO right! Life. Is. Real. And the more REAL my life gets, it seems like the closer and more incredibly REAL God gets with my life. You inspire me my friend! Love this link-up :) You make my week! Seriously!!! Yeah, I've said "I will never ..." a few too many times. :) You're right that when we're real, we can see God. And that's definitely a good, life-changing even, thing. I'm so glad you were encouraged!